A perceptual map works well when the PowerBall approach is not robust enough, yet many of your attributes and criteria remain fuzzy and subjective. Thus we are able to help a team compare and prioritize its options using a rich visual display, called a perceptual map, that provides visual support (in a directional manner) of your optimal and sub-optimal options. With a perceptual map we can also expand our understanding of the options, since there is likely more than one right answer. By locating the options we stimulate discussion and solicit the rationale for placement. Analysis provides insight about which options may demand more or less urgent attention and care. After you have helped the team build their options (eg, actions to take), consider arraying them along a perceptual map. 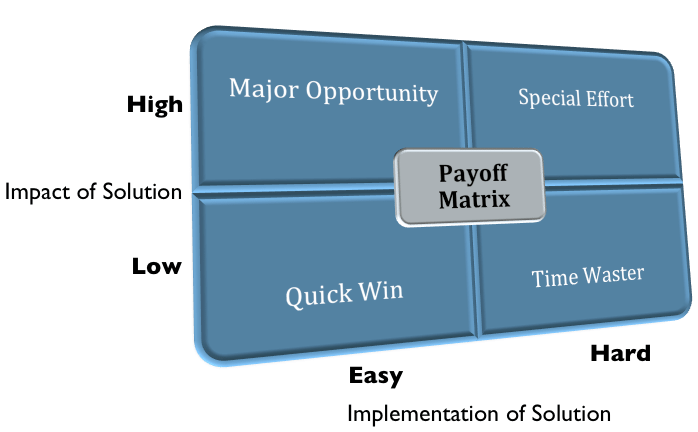 One version called a Payoff Matrix dimensions includes: 1) Ease of implementation, and 2) Impact of the solution. If you have dozens of options, consider using a large white board. You should use Post-It® notes because discussion will lead to moving around (relocating) some of the options. Be careful to know how to illustrate and define “High” and “Low” and to the extent possible, draw from your personal metaphor or analogy (Agenda discussion point in the MG RUSH curriculum). Use active listening and challenge frequently to discover evidence that can be used to support beliefs and claims. Enlighten all participants as to which conditions are required to support the arguments. Modify the “Two-by-Two” illustration below by adding a moderate dimension, making it what others call a “Nine-Block Diagram” (or “9 Block Diagram”) shown at the bottom. In Six Sigma, comparisons are made of the CTQs (Critical to Quality) with the improvement or weighting factors. 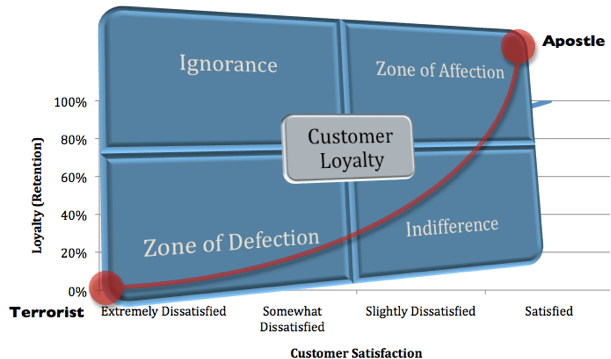 Identify two dimensions that most affect the decision or situation. Typically array from low to high but be prepared to define what is meant by “Low” or “High” (see PowerBalls). If you need to use a third dimension, such as quantity, consider varying your symbols or notes. Change the size of the Post-It notes so that width, height, or shape equates to the third dimension. Consider using different colored Post-It notes that relate to a third or fourth dimension such as large, medium, and small. The alternative shown next is the Nine-Block Diagram that provides an additional, third sector of information contrasted to the Two-by-Two up above.